Woo Hoo! One more place ticked of my bucket list! Going to Italy was amazing. 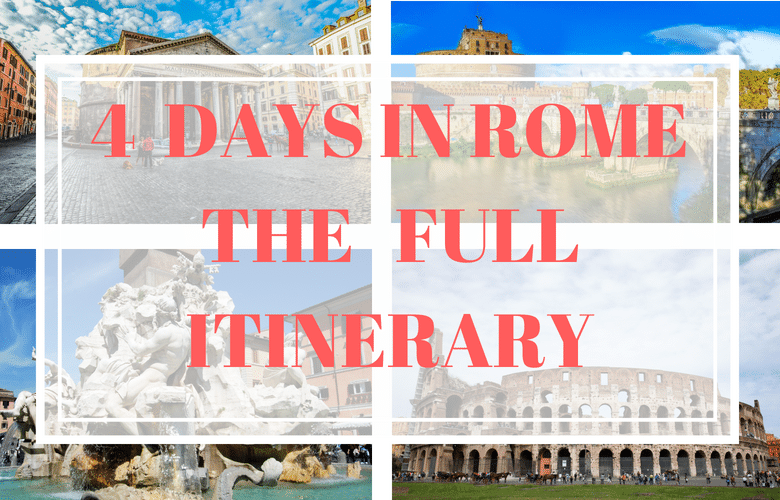 Now we only had 4 and half days in Italy, Rome, but we made the most of it! 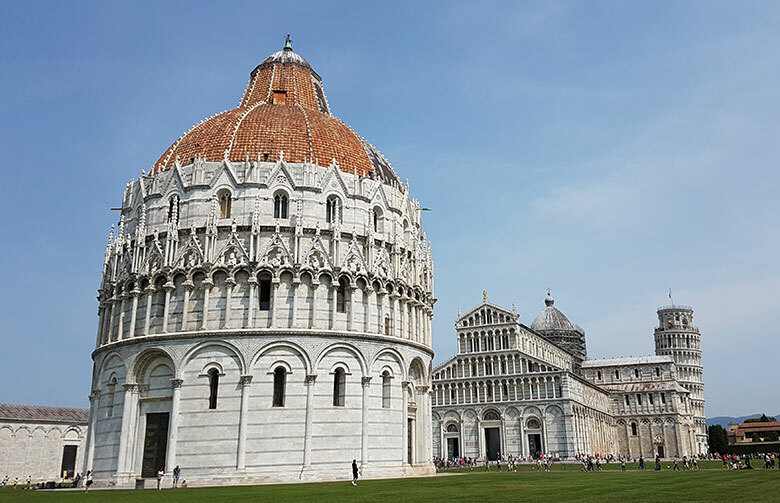 We even squeezed in a day trip to Florence and Pisa! 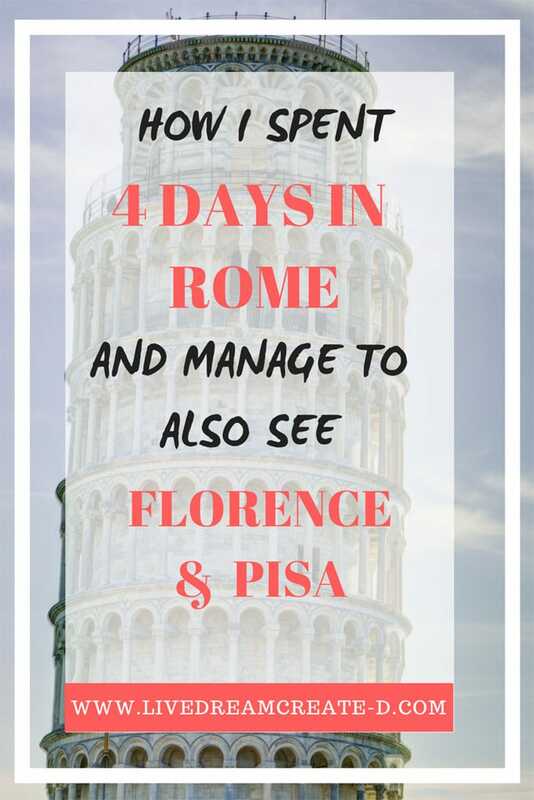 I will be telling you about my itinerary for the 4 ½ days I spent in Italy to give you an idea of what you can do and see there for your next visit there. Have in mind that I traveled with 3 other women! Before I get into the itinerary I just want to warn you all that no matter the time of year you go to visit, there are always huge lines to get into the attractions. This is something that you cannot avoid unless you get a pass of some sort to skip the lines. Keep in mind that even with the passes you still have to go through other lines and also the security check but these lines are very very shorter in length than the other lines. We actually traveled during peak season and it was scorching hot. I will talk more about the passes in my next post. 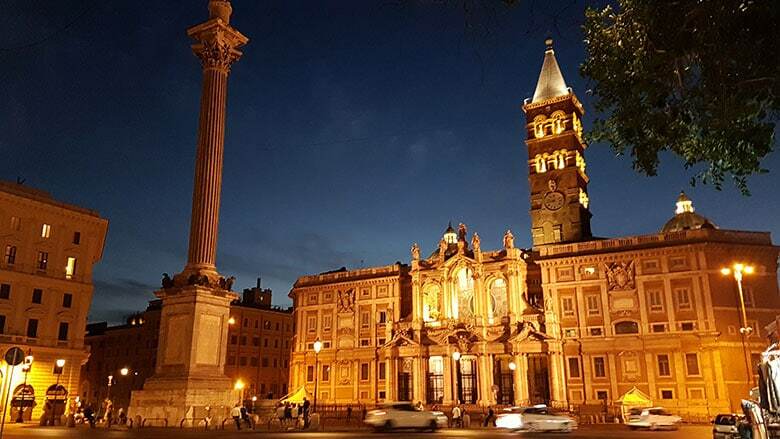 Arrival in Rome at night so we got out pre booked taxi and went straight to the Bed & Breakfast, left our bags, paid the taxes and signed all documentation and then we were off to get dinner and explore. We didn’t get too far but we did stumble upon a great restaurant and we had a great first dinner with Pizza, Salad and Lasagna! After dinner we went straight to the hotel to sleep as we had a big day ahead of us! I woke up bright and early only to find out that, one of my travel buddies was not feeling very well. This meant an hour delay in the morning. To be totally honest I started this holiday off feeling exhausted and tired too. So a combination of my travel buddy and me we didn’t start the day off very well. Anyhow we managed to do more than we planned on doing. First stop was the Colosseum. Just a short 15 min walk from of B&B and we were there in front of this GIANT structure. I just stood there in amazement at how tall it was. Questions running through my head like… How? How did they build this back in the day? Just how did they do it without all the modern technology and equipment? 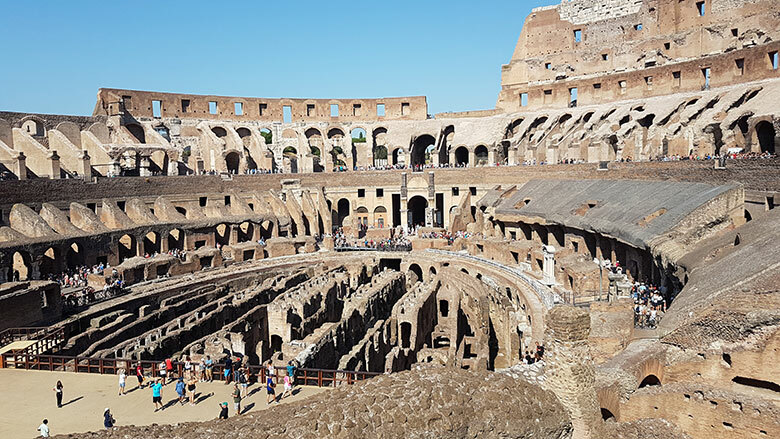 As you get closer to the Colosseum you feel like an ant next to it. It is truly magnificent, and the sheer size of it is jaw dropping! 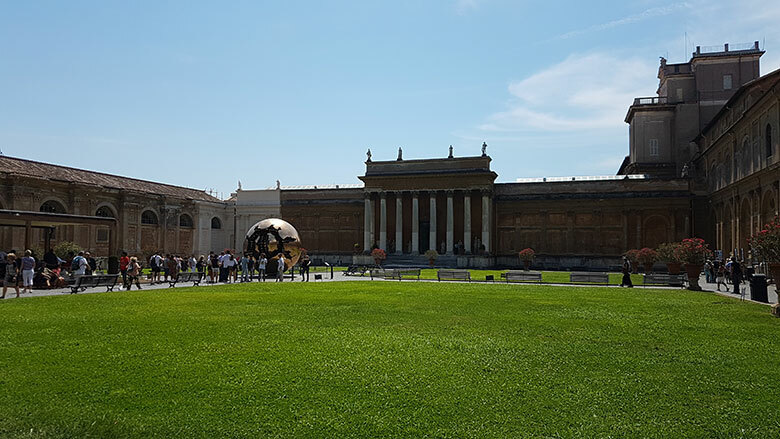 It has to be my favourite attraction in Rome. Once we finished inside of the Colosseum we moved on to the Roman Forum. Another vast area to explore! Once we did this we were already very hungry so we headed to lunch. It was the nearest place we could find and because of this it was the worst meal we had on our entire trip! 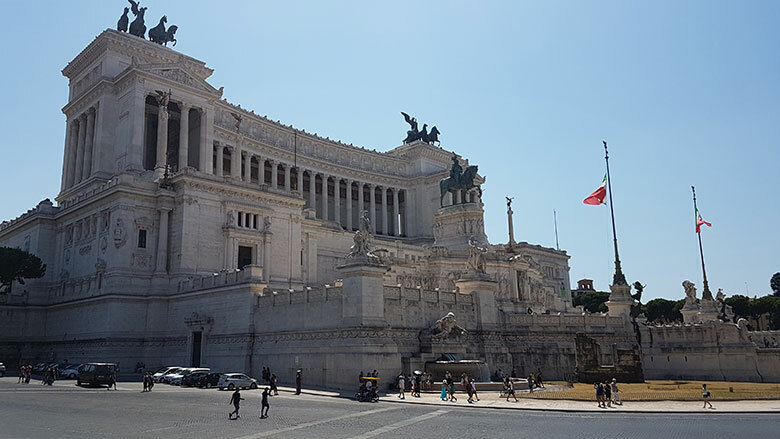 After lunch we headed to the Monument of Victor Emmanuel II. Another gorgeous building and extravagant with marble and stone! Don’t forget the awesome views from the top! After this we headed back to our B&B where we rested a bit, had a shower and refueled our batteries to get back out there once it was cooler. 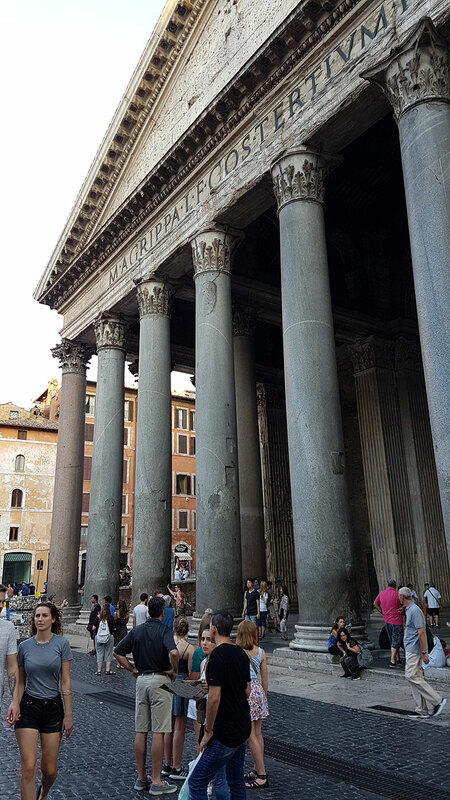 Once back out on the streets we headed to the Pantheon and the to the Trevi fountain. We got a bit lost but no matter where you turned there was something spectacular to see. We saw many churches and fountains everywhere. 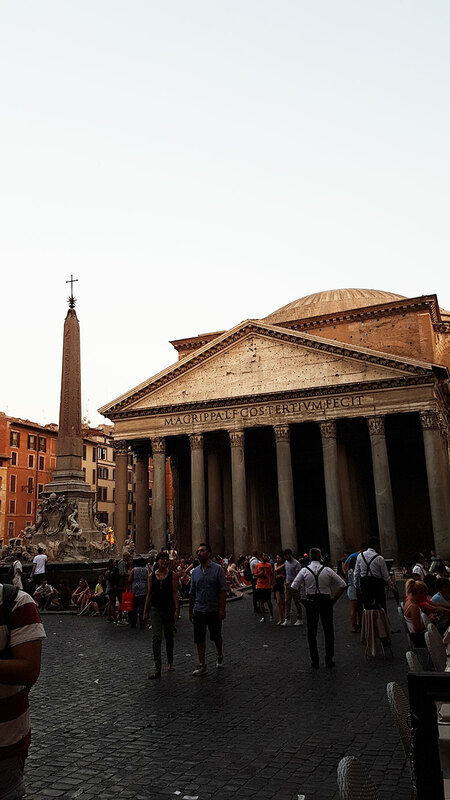 The pantheon is, yep you guessed it, huge! 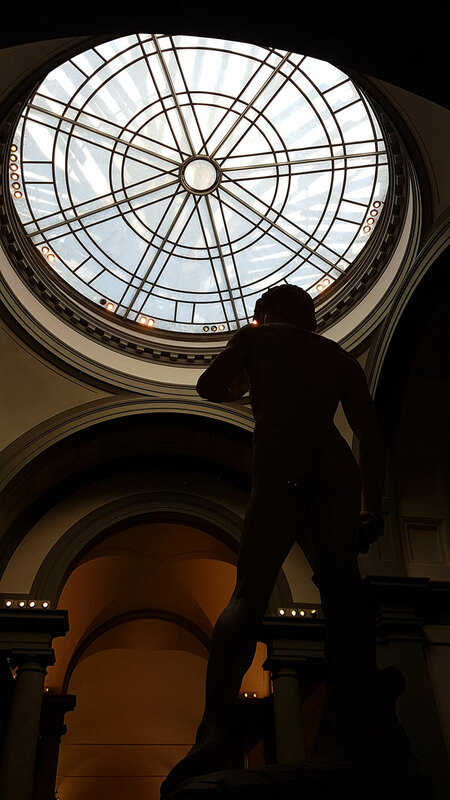 When you enter and you see the ceiling….well you just stand there, along with everyone else gazing at the design and the hole in the middle! Everyone taking photos of the ceiling in different angles and also selfies, it’s quite hilarious if you think about it. 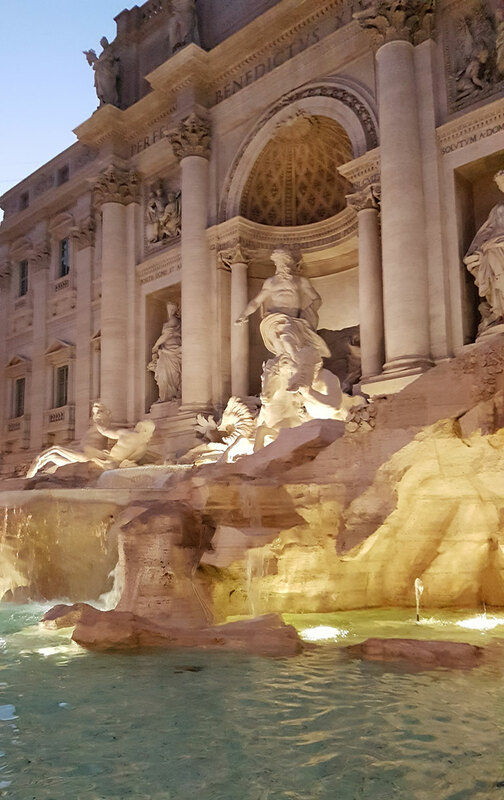 As for the Trevi fountain, it was sort of hidden away in a nook! As you come round the corner of the street you end up walking straight to it but due to all the tourists there you don’t really get to see it and it looks smaller than what you’d expect. I actually made my way down to the fountain and threw my coin and made my wish. Took a few photos too and then left for dinner and back to our B&B. Dinner was wonderful and it was between the Pantheon and the Trevi fountain, so it wasn’t too touristy! 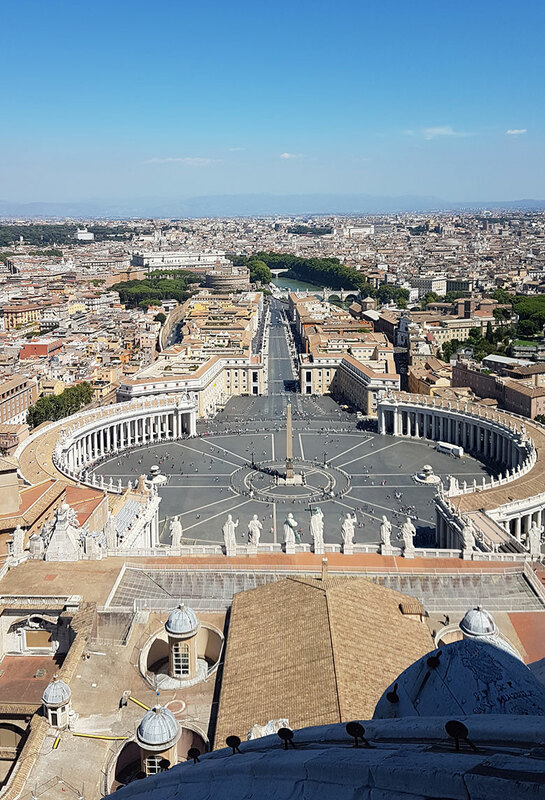 After this we headed to the Vatican City were we spent all our day! We saw the Museums and the garden outside of the museum. Then we went to the Sistine Chapel! 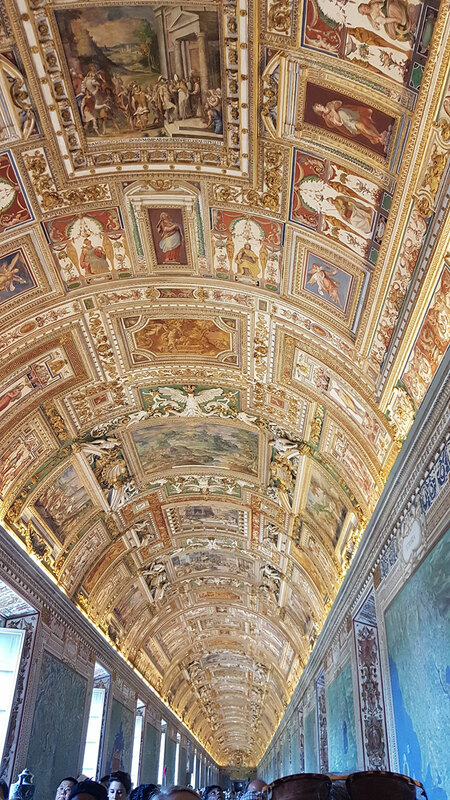 I don’t need to repeat myself that everything was huge in size apart from the Sistine Chapel. The paintings within the Chapel we extraordinary, one specific part of the painting looked like his legs were hanging in midair. The 3D paintings looked so real! 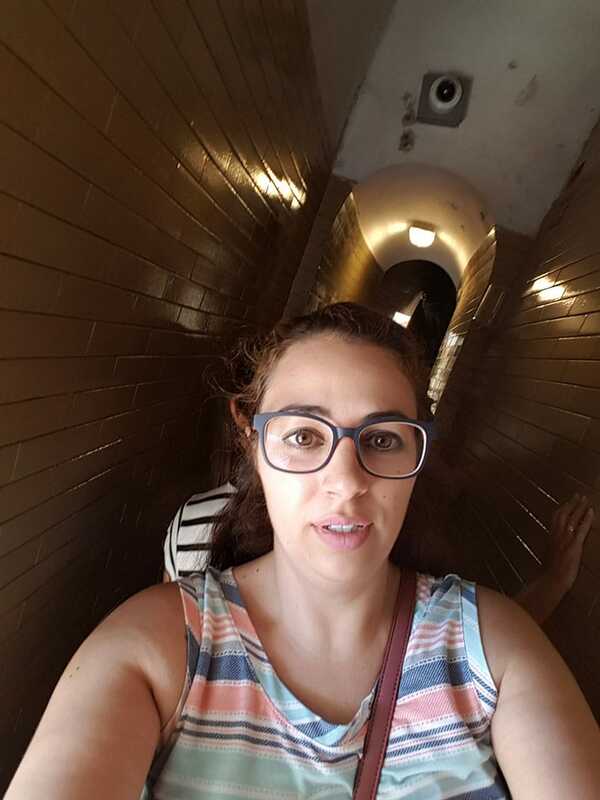 After this I made my way to go up the Cupola and see the Vatican City from above while the rest of my travel buddies went on to see St. Peters Basilica. One thing I can’t stress enough is that you MUST GO TO THE TOP AND SEE THE AMAZING VIEWS! It was only €8 to go with the lift up to a certain point and then from there up by foot. It is work every 231 steps up there! 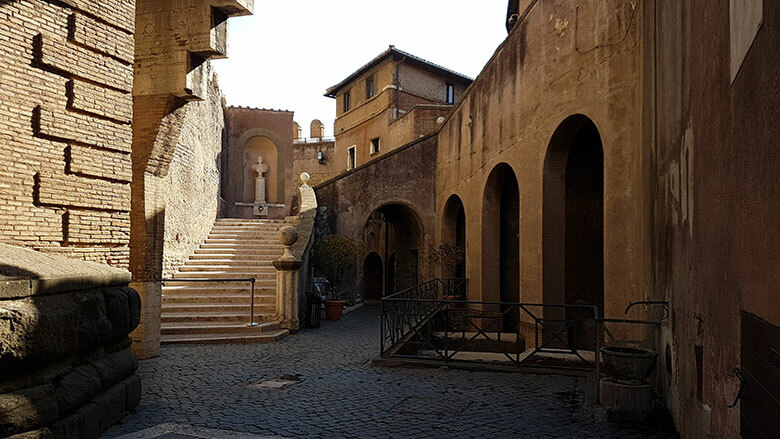 Then on the way down you enter the Basilica (St. Peters Church). Yet again another gigantic building and gorgeous paintings, icons and statutes! Then out onto the square, took more photos and then off to lunch. Again we were very lucky we had a great meal (very late lunch I would say) and then headed back to our B&B for some much needed rest. We were out again after a few hours of rest. We walked around our area, did a bit of souvenir shopping and sat down to have an ice-cream. No dinner as we were full from our late lunch. We had an early night as the next day we were going to get up very early to go to Florence! Early morning wake up and headed to the train station. 1 ½ hour later arrive in Florence. Wow. Just wow. Clean streets, beautifully coloured buildings and winding streets are just a few things you notice immediately. This place is magical. 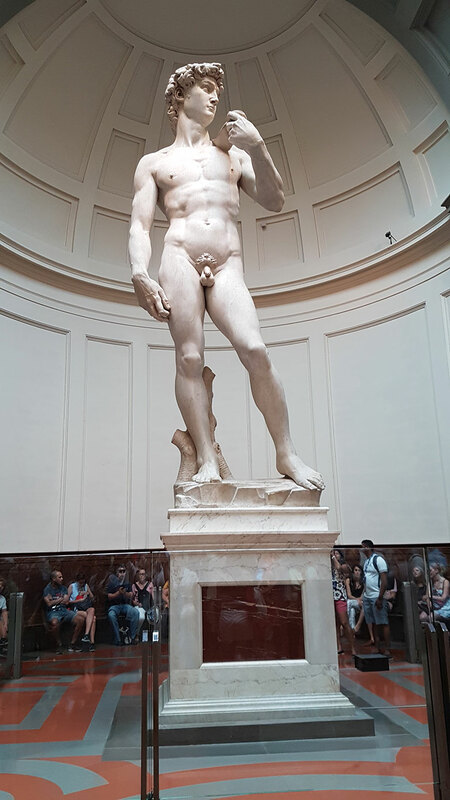 We made our way down to the Accademia Gallery where we saw the Statue of David along with other work of Michelangelo’s but also other artists. 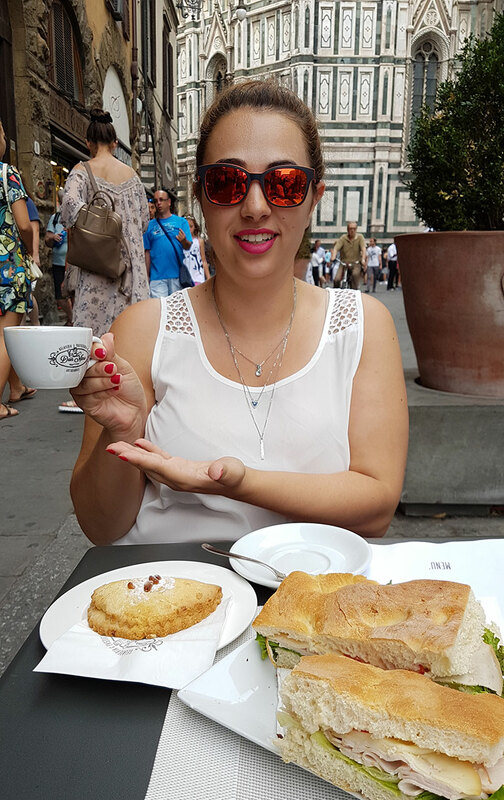 Then we stopped for a snack and cappuccino right next to the Florence Cathedral. Just sitting at the café looking out toward all the artists drawing and painting right beside the cathedral was amazing. I could have stayed there all day! 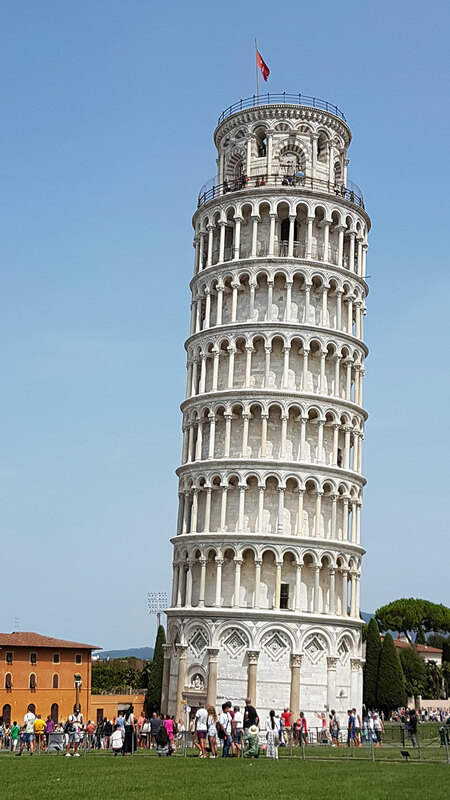 But we were off again, off to see the leaning tower of Pisa. One hour away from Florence and getting there in the heat was too much for us to walk so we took the bus. It was just as I thought it was. Gorgeous green grass, surrounding the buildings and hundreds of tourists all trying to take photos in weird poses! Then we headed back to Florence for some shopping, ice-cream and a snack and then back on the train to Rome. We decided to have an early night and rest up! 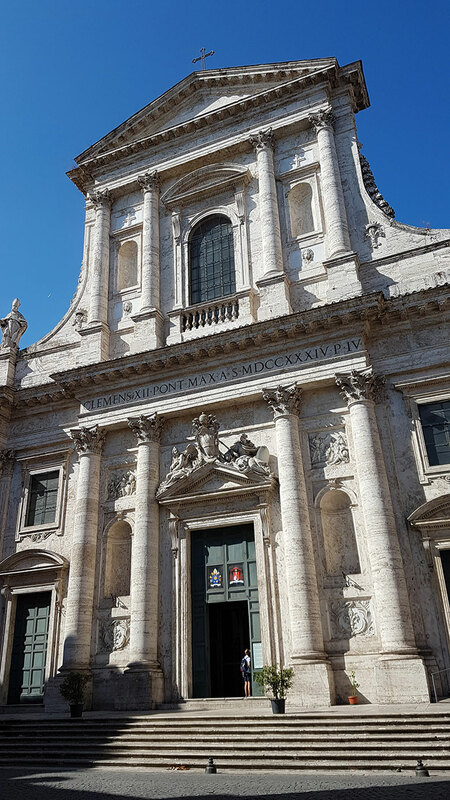 Started bright and early and did a bit of shopping and stopped in to see the church – Santa Maria Maggiore- while making our way down towards the Spanish Steps. Wow. Everything seems to amaze me so much. I’m either easy to wow or I was not expecting everything to be so grand! All of the churches are huge and elegant. All the building and the architecture is regal and grand. 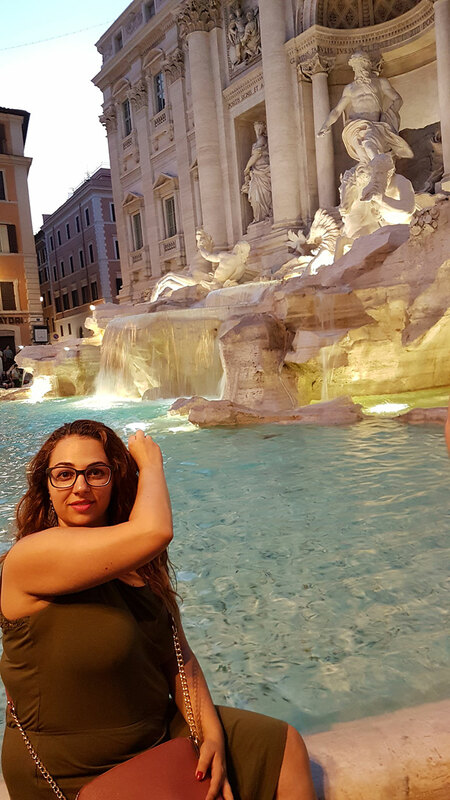 I actually felt really at home – Italy gave me the feeling of Greece and Cyprus. 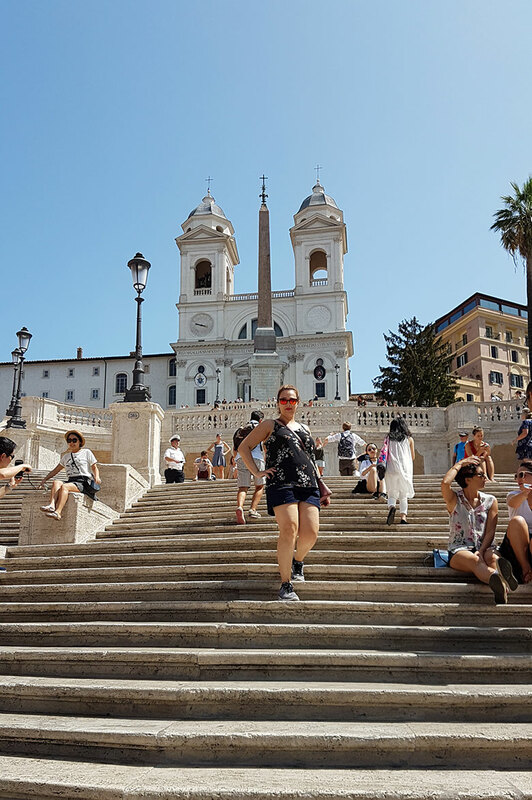 As we made our way to the Spanish Steps we didn’t realise it but we had arrived at the very top where the church was. We entered and they were actually having mass so we just had enough time to see inside and then we headed down the stairs and towards the shops. Now these shops were all top end – Prada, Dior, Gucci etc. So we only window shopped! Then had homemade pasta for lunch and back to the shops! 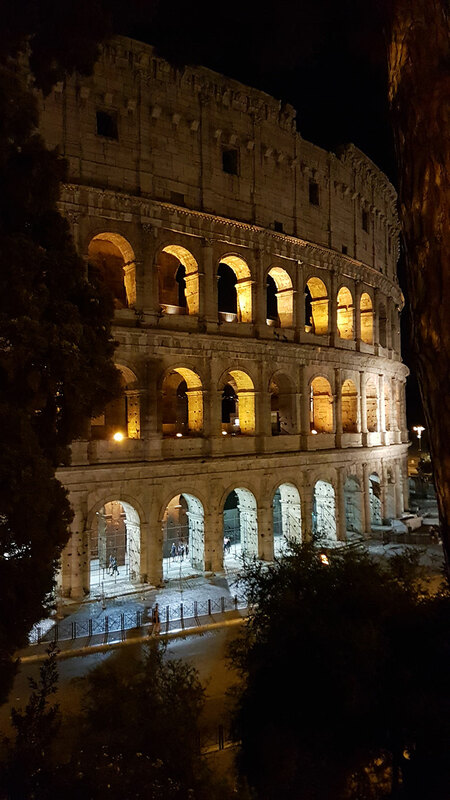 After a long day shopping we rested at our B&B and went to see the Colosseum at night – took wonderful photos with the lights all on the Colosseum – and went for ice-cream and then back to the B&B. The 3 of us (the 1 ill travel buddie decided to sleep in) took the bus to Castel Sant’Angelo. Not inside but only outside. It was nice and cool in the morning and it was really peaceful. I was trying to take it all in one last chance I had! Rome you have treated us well! On our way to the bus stop we found another church – Clemens XII – it was the creepiest church I had seen all week! The statues here all had creepy looking faces! Anyway we got the bus back to the main station, had a quick lunch and off to the airport. At the airport and sitting in the plane I was thinking of all the fun and hilarious moments we had on this dream trip of mine! I was looking through my photos and I said to myself – one day I will return! I wanted to return and see the things I didn’t get a chance! Looking back now that I have been it truly is a dream comes true for me. It is so worth it to go and see all the history, architecture, art and culture. 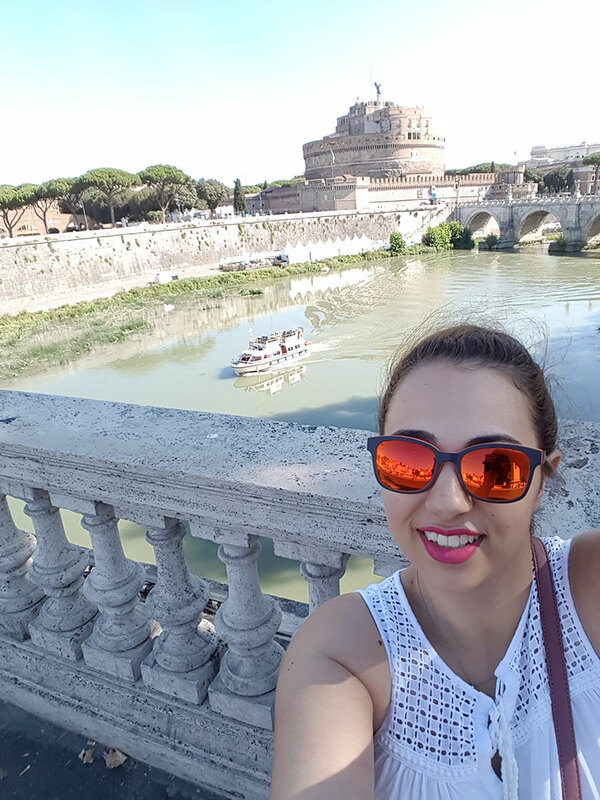 When you all decide to visit Rome then my advice is to go any other time of year apart from July and August, the heat won’t allow you to do as much as you want to. Everything can be done by foot (as long as it’s not scorching hot like in July and August) and it’s great getting lost in the winding streets as you get to see some fantastic buildings and shops! 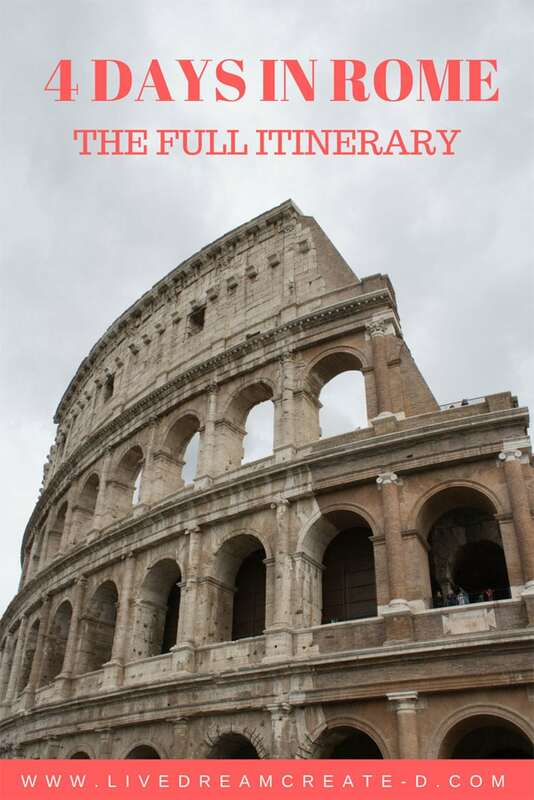 I hope this helps you plan your vacation to Rome. If you have any questions about anything that I haven’t addressed then pop me a question below or send me an email. 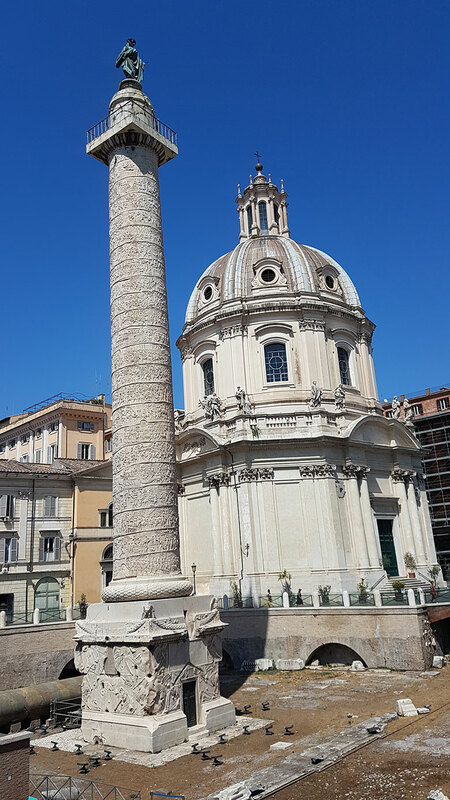 Rome is marvellous! And so are your pics! Your pics talk how grande Roma is. With its amazing traces through history. Wish I am there someday..
Edwin I really hope you do get the chance to see everything for yourself as it is always best to see these from up close. They are indeed grand and when you are there you feel like you have stepped back in time. 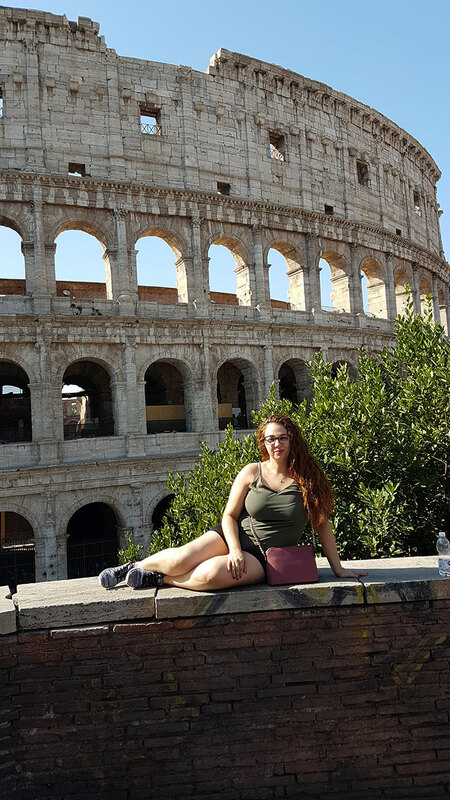 Thank you for you compliments on my photos and thank you so much for stopping by and reading all about my experiences in Rome. The pictures are insanely beautiful. 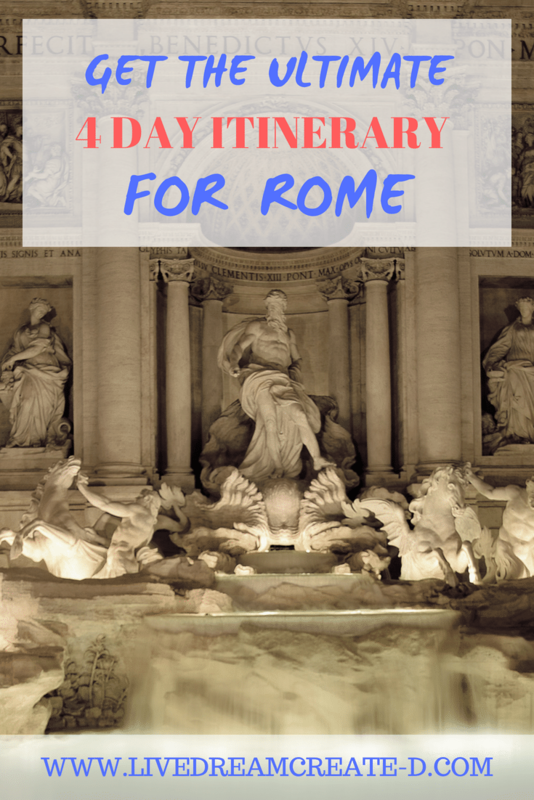 I really want to travel a lot but Rome was not anywhere on my list. But after reading about your trip and looking at these amazing pictures, I’m definitely gonna include it as well. There is just so much to see and explore there. WOW! I absolutely loved this article. AND YOU LOOK GORGEOUS! I read this with great interests. We are planning a trip to Rome next year. So you have given us some great insight. That is wonderful! I hope this helps you plan out your trip and gives you some pointers! I love it when I am able to help people through my experiances. If you should have any other questions please send me an email or msg on instagram or facebook. I will be happy to help you.